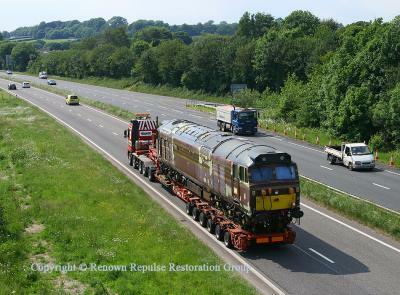 50017 on the A38 During the summer of 2009 50017 Royal Oak was puchased from its previous owner Rev Dr John F Kennedy by a private individual, with a view to basing the locomotive at the Plym Valley Railway. 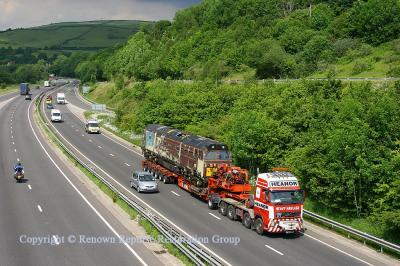 Here the loco is seen on the 3rd June 2009 descending Telegraph Hill on the A38 during the journey south. During the summer of 2009 50017 Royal Oak was puchased from its previous owner Rev Dr John F Kennedy by a private individual, with a view to basing the locomotive at the Plym Valley Railway. 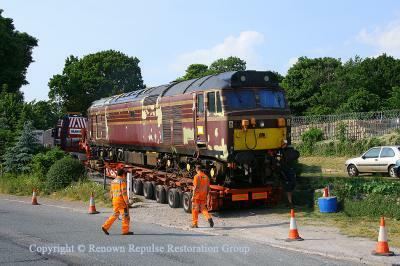 Here the loco is seen on the 3rd June 2009 descending Telegraph Hill on the A38 during the journey south. 50017 passes Buckfastleigh on the A38 Here 50017 is seen passing the turn off for the South Devon Railway where sister locomotive 50002 Superb is undergoing restoration to operational condition and unrefurbished appearance. Here 50017 is seen passing the turn off for the South Devon Railway where sister locomotive 50002 Superb is undergoing restoration to operational condition and unrefurbished appearance. 50017 on the A38 at Ivybridge 50017 Royal Oak passes Ivybridge nearing journey's end on the 3rd June 2009. 50017 Royal Oak passes Ivybridge nearing journey's end on the 3rd June 2009. 50017 on the A38 near Ivybridge Another view near Ivybridge on the outskirts of Plymouth, 3rd June 2009. Another view near Ivybridge on the outskirts of Plymouth, 3rd June 2009.